Meeting Ingrid & Beat at the entrance to Ironwood Beach on Maui’s West side, I immediately liked them. Beat had just said something funny to her & she was laughing! Of course her laughter spilled over to Marni the coordinator for this sweet elopement and she too was laughing! Meeting someone while they are laughing has got to be the best! 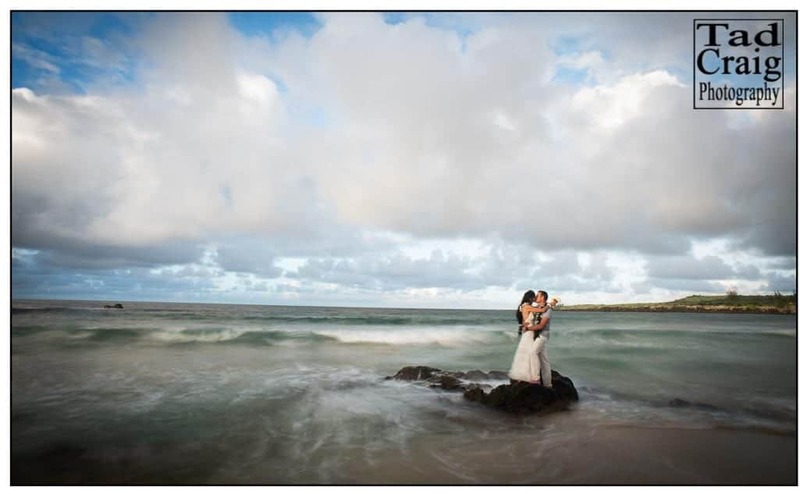 Coming all the way from Switzerland, they had decided that an elopement, just the two of them was what they wanted. She didn’t even have a wedding dress! Upon arriving on Maui they had last minute wedding plans with the coordinator and of course finding that dress! Walking the streets of Paia town they found the Tamara Catz boutique and fell in love with this great dress that fit her style perfectly! Gorgeous! So after some pre photos we walked down the long wooded pathway and out on to a deserted beach with the pacific ocean lapping at its edges! Beat continued to whisper in her ear making her laugh and enjoy every moment of the day! So romantic! Their minister was Ernest Puaa, who is one of my favorites for the way he makes it so personal & genuine! The ceremony was actually pretty quick & suddenly it was done! They were married & both were just beaming with excitement! Ingrid loved Ernest’s words so much that she went up to him and sort of settled in to his arms to thank him. Was a super funny moment and you find that series of images and the the final picture where all three are laughing! Once we had finished the images with the minister, the three of us ventured up on to this super cool rock formation that had all sorts of unique photo options, including that ripping water reflection image that I love! Was such a great couple to photograph, seeing their joy & love for each other is what it is all about!